Rats pretending to be a snake to avoid predators.. woww!! An interesting video is shared on social media sites like Twitter alleging to show Rats Moving Like Snake to Avoid Predators. The accompanying message suggests the group of Rats are pretending to be a Snake to deceive their predators and safeguard themselves from possible attacks. Although the video footage is real, the claim as such is a hoax with some valid information explained below. On 14th Jan. 2019, Twitter user Caine. shared the twenty seconds footage describing it as Rats pretending to be a snake to avoid predators. The Twitter post garnered millions of views because of the interesting nature of content. Many viewers, however, thought the video is fake and possibly an edited one. The video is real but does not show Rats moving like Snake to avoid Predators. It in fact shows a Caravan of Shrews, which hold each other’s tails and scurry across the ground like a furry centipede. The low-resolution footage in video gave viewers the appearance of a fluffy snake. The full video appeared on YouTube earlier in November 2017 along with audio (shown below). A family seems to have spotted the caravan of Shrews inside home and are having fun around them, probably trying to drive them out as well. 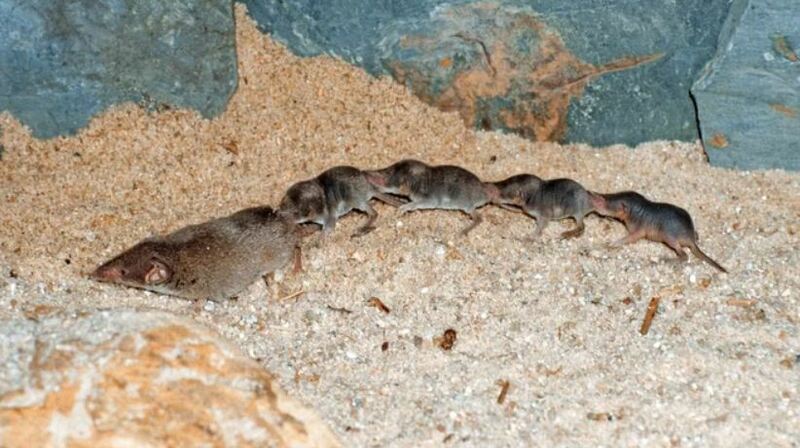 As a matter of fact, what you see in the video is a mother Shrew leading her babies in a train, known as a caravan. They travel together in an orderly fashion typically when they lose their nest. In such situations, the mother tries to evacuate her young ones to safety. Sometimes in that way, the shrew pups may also be encouraged to explore their surroundings. In past, some similar videos of Shrew caravan surfaced online and grabbed attention of viewers. Shown below is another cute video wherein you can see Shrew babies travel along by holding on to their mother’s tail. For your information, Shrews are not Rodents like Mice. They belong to the order Eulipotyphla, like the animals Moles and Hedgehogs.